Tonight begins Yom Kippur – the holiest day on the Jewish calendar. 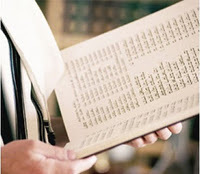 Traditionally, Leviticus 16, which deals with the proper protocol for the High Priest during the special Yom Kippur service, is read in the synagogue on the morning of Yom Kippur. The Torah introduces the Yom Kippur service immediately following the death of Aaron’s two sons, Nadav and Avihu. This demonstrates that there is a direct connection between this tragedy and Yom Kippur. According to the Sages, part of the transgression committed by Aaron’s two sons is that not only did they offer improper offerings, but they entered into the Holy of Holies, which only the Kohen HaGadol (the High Priest) is allowed to do. Rabbi Eleazar ben Azariah (First Century) comments that either sin would have been enough to warrant their death. As a result, the entire rest of the chapter deals with the proper protocol of Yom Kippur and the order for the High Priest to enter into the Holy of Holies. It is taught that Moses’ long process for seeking forgiveness on behalf of the Jewish people for the sin of the Golden Calf ended on the tenth day of Tishrei (Yom Kippur) when he returned with the second set of tablets. That day became associated with forgiveness. The Torah, in several references, goes into great depth as to the specifics of Yom Kippur and the proper way of observing the most holy day. The obvious question is why the Torah goes into so much detail regarding the observance of Yom Kippur? The Jewish holidays are known as mo’edim. The word mo’ed, in Hebrew, is best translated as a divine set/appointed time. It is a time when G-d chooses to meet with us. Yom Kippur is our opportunity for a supernatural encounter, and the day G-d’s forgiveness and mercy is most abundant. G-d wants to be in relationship with us, and Yom Kippur is our opportunity to perfect ourselves and prepare ourselves to be used by G-d in the coming year. The shofar serves to call us to teshuvah (to repentance), and for G-d to act mercifully toward us and pardon us for our shortcomings. G-d gives us the opportunity of the High Holiday period to prepare ourselves and make things right with both our Creator, and with those around us. The Torah is concerned about all these details because G-d cares about protocol. Each detail on Yom Kippur teaches us that it is not about ourselves. That the world does not revolve around us. Each one of us is reminded of our ultimate fate and judgment on Yom Kippur, and our individual, as well as corporate need for atonement. Yom Kippur is also a reminder of G-d’s mercy and ability to bring atonement for our shortcomings. According to Hebrews 9:6-28, Yeshua is our Great High Priest, and it is through him that kapparah, that atonement for sin has already been made. By seeking to truly make things right this Yom Kippur, and to carefully observe G-d’s instructions regarding this most holy day, let us merit the sealing of our names in the Book of Life, and the ultimate assurance of our atonement through Yeshua. May the final shofar blast at the end of Ne’ilah, the final Yom Kippur service, truly be the blast which announces the arrival of our long-awaited and beloved Messiah! G’mar Chatimah Tovah – May you be sealed for a wonderful New Year! This entry was posted in Uncategorized and tagged High Holidays, Holidays, holiness, Jewish life, Spirituality, Yom Kippur. Bookmark the permalink.